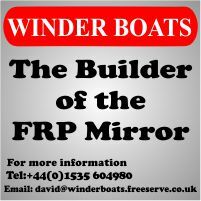 Below are recommended lengths and materials for the running rigging (sheets and halyards) on a Mirror dinghy (both traditional gunter rig with a gaff and the more modern Bermuda rig). In general the UK MCA recommends the use of modern, high performance ropes with a dyneema/spectra, Vectran or kevlar core (such as Marlow Ropes Excel Racing) to minimize stretch. Jib halyard - 8 metres of 3mm or 4mm diameter dyneema/spectra, Vectran or kevlar with polyester cover. Jib sheet - 6 metres of 6mm diameter line with 8 or 16 plait matt polyester cover. 5.160 metres is the minimum length if you are trying to save weight etc. Kicking strap - utterly basic (i.e. looped around the boom and tied on the stowage bulkhead) 2.5m of 3mm dyneema/spectra. 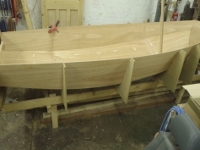 For better kicking strap systems, it depends on the arrangement, see Fitting out the hull. Main halyard (bermuda mast) - 11 metres of 4mm dyneema/spectra or kevlar with polyester cover. For some reason (which I have never managed to bottom out), some Mirror sailors complain that their (Bermuda rig) halyards slip in their Clamcleats. Some racers specify wire halyards & hook up racks when they order a boat. It seems to happen with Marlow kevlar cored rope (which Superspars used to supply as standard with their masts) but also with other types of modern rope. What's really odd is that I don't have the problem on my gaff rigged boats where I use either spectra or vectran halyards, and the main halyard is much, much tighter on a gaff rig than it ever is on a Bermuda. I suppose it could be something else, like the way the rope come through a slot in the mast to the cleat, but I can't see why that would cause a problem. Might just be worth checking with the manufacturer that the rope you are thinking of using is suitable, or recommended for use in Clamcleats. Main halyard (gunter mast with a gaff) - 8 metres of 4mm dyneema/spectra, Vectran or kevlar with polyester cover. Main lacing (gunter rig) - for 'stitch' style lacing, allow 250mm/lacing eye + the distance between the upper and lower lacing eyes + 100mm for tying knots (one each end). On my Hyde mainsail with four lacing eyes, that's 2m & it needs to be thin (say 1mm) line. If you use a 'sprial' style lacing, you need a bit less. Note - you need a separate line to lace the tack of the mainsail, see below. Main sheet (centremain with purchase on bridle) - 8 metres of 8mm diameter line with 8 or 16 plait matt polyester cover. Main sheet (traditional aft mainsheet system) - 6 metres of 8mm diameter line with 8 or 16 plait matt polyester cover. Mainsail tack lacing (gunter rig, but can be useful on Bermuda rig if the tack keeps pulling out of the track). If you go once around the mast 350mm of 3mm dyneema/spectra. If you go twice around, 700mm of 1mm dyneema/spectra. Spinnaker halyard & retriver line (cleat on aft edge of daggerboard case) - 11.580 metres of 3mm dyneema/spectra or kevlar with polyester cover. 3mm is a bit of a compromise, it's good on the retriver line side of things (not too heavy), but it's a bit thin (hard on the hands - so suggest you use gloves) on the halyard side of things. However, if you go for 4mm (I think Superspars supply 4mm spinnaker halyards in their masts), I find that's too heavy and stops the spinnaker flying properly when it's light. I have tried joining different thickness, but that didn't work for me (but if you are ace at splicing, you might be able to manage it), or, if you use rope with a cover as I suggest, you could strip the cover off the retriver line side of things to save a bit of weight. Spinnaker pole downhaul (Flyaway pole system on Bermuda mast) 4.3m of 3mm dyneema/spectra line with a knot inside the mast to limit how high the pole can rise, then 1.5m of 5mm elastic (lengths TBC) running up to the masthead fitting. Joining the elastic to line with a knot can cause the downhaul to jam from time to time, so the pole cannot be deployed. Joining the line to elastic by sewing may improve the situation (TBC). Spinnaker pole uphaul (Flyaway pole system on Superspars Bermuda mast with cleat on mast) - 5.330 metres of 3mm dyneema/spectra or kevlar with polyester cover. Spinnaker sheet - 13 metres of 4mm or 5mm diameter dyneema/spectra with 8 or 16 plait matt polyester cover. It can be difficult to source this combination, so you may have to use a line with a normal polyester cover. Mainsail control lines - 3mm or 4mm dyneema/spectra or kevlar with polyester cover. Lengths vary depending on exact arrangement, see this article on control lines.